"Recently, I found Angel Of The Morning soundtrack from 2016 superhero film – Deadpool is really worthy of storing up. Any MP4 to MP3 converter Mac can help me to extract MP3 audio track from my downloaded MP4 Deadpool video file?" Beyond question, most of movie soundtracks are so amazing and attractive that fans want to extract MP3 audio from MP4 on Mac for freely enjoying or making ringtone. Nevertheless, the question is: how to find the most economic yet versitile tool to rip audio from MP4 movies/videos? Keep reading to find out. MacX Video Converter Pro, well-known MP4 audio extractor, can easily handle almost all kinds of MP3 sound extracting issues. Specificly built-in 320+ video and 50+ audio codecs, this MP3 converting software supports seamlessly transcode any video to over 180 video formats and 14 popular audio formats (MP3, AAC, WMA, iPhone Ringtone, AC3 and more) on Mac (macOS Mojave), for example, convert MP4 to MP3, AVI to AAC, etc. What's more, this first-rate Mac MP3 converter is also able to rip audio/sound/MP3 from MKV, MOV, AVI, MTS, FLV, etc. movie/video files and extract MP3 audio from YouTube, Vevo, Dailymotion and more 1000+ sites. Bonus feature: world's fastest conversion speed due to the application of multi-core CPU utility, hyper-threading tech and Intel Quick Sync Video hardware acceleration tech. 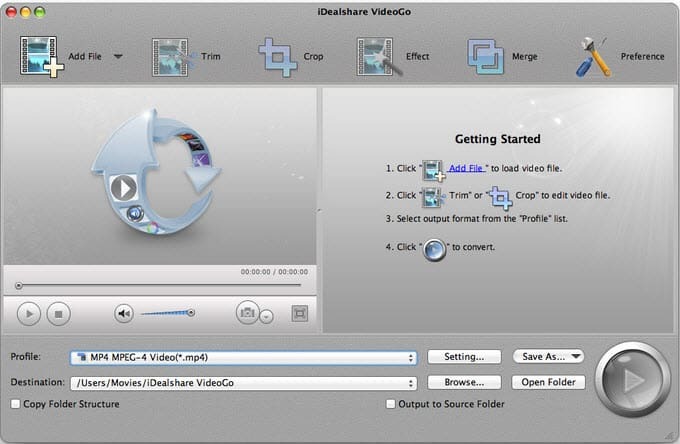 Featuring with HD, 3D and SD video conversion, iDealshare video converter has strong ability to convert videos among a large number of video formats including AVCHD, MOD, WMV, AVI, MKV, VOB and more. Of course, audio extraction function is another key feature that makes iDealshare extraordinary. And this functional Mac video converter also can effortlessly extract audio from MP4 on Mac OS X and convert audio files (FLAC, WMA, OGG, CAF, APE, DTS, WAV, RA, AU, 3GA, RAM and more) to play in iTunes, iPod. Bonus feature: Batch download video file is a piece of cake for iDealshare MP4 to MP3 converter Mac. Comparing with the former MacBook Pro/Air video to mp3 converters, Leawo Video Converter Ultimate for Mac is more expensive. However, it is easy to understand. Firstly, Leawo Mac video converter can painlessly tackle the problem of MP4 to MP3 conversion and extracting MP3 sound from MKV, FLV, AVI and more video files; secondly, in addition to common video formats conversion, Leawo video converter for Mac also supports converting Blu-ray/DVD movies to 1080P HD formats on Mac OS X(Yosemite/El Capitan); thirdly, online video download is feasible. Bonus feature: Capable of burning up 1080P videos to Blu-ray/DVD disc with 10+ disc menus. As a powerful and free MP4 to MP3 converter, MacX Free MP3 Video Converter can transfer any video/movie file to MP3 on Mac for playback on iPhone, iPod, iPad, etc. The supported input video formats include AVI, MPEG, WMV, FLV, F4V, H.264/MPEG-4, MOV, RM, RMVB, VOB, ASF, 3GP, Google TV, WebM, Vpx 8, MP4 and so on. Certainly, extracting audio from video online (YouTube) is as easy as pie to this MP3 audio extractor free. Online free MP3 video converter is the most favorite MP3 conversion program to a majority of people all the time because it can save some tedious work like downloading, installation, testing and more. Truly, Zamzar is such kind of practical MP3 audio extractor online without consideration of computer OS. 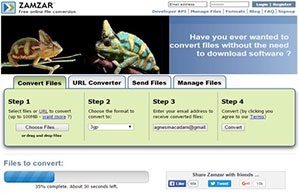 Zamar surports 1200 different conversions including video/audio transcoding (extract MP3 from MP4 Mac, convert M4A to MP3, transfer WAV to MP3, etc.). Online-convert.com allows users to free convert MP4 to MP3 and convert video to MKV, MOV, MP4, etc. 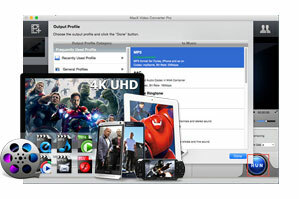 video formats for compatible with iPad iPhone and other mobile devices. It is worth mentioning that this online MP3 converter is also an outstanding image converter, document converter, Ebook converter, Archive converter and hash generator. Probably you will love this free audio conversion tool once you try it. In a conclusion, each of those Mac MP4 to MP3 converters has many advantages and users may wonder which one is the most useful one. Anyhow, some people will select the free one like online-convert.com to deal with the simple work of splitting audio from video. But when it comes to MP3 audio file size compression, iPhone ringtone editing or other advanced audio editing features, commercial MP3 audio extractors become more competitive, such as, MacX Video Converter Pro, Leawo Video Converter Ultimate for Mac, etc. Before separating audio from video, you need finish the task of free downloading the software at first. Then follow the below steps. Launch MP3 sound extractor on Your MacBook Pro/Air and load source MP4 video by clicking "Add File" button. In the output format area, click "to Music" tab and choose MP3 as the output format. BTW, you also can choose AAC, AC3, iPhone Ringtone, WMA, WAV (lossless quality), etc. audio formats as the output profile according to your request. Note: you don't need to adjust various parameters of music profile since they are well adjusted in advance by developer. Click "Browse" button to find out a proper destination folder to save the converted MP3 audio file. Click "RUN" button to start changing MP4 format to MP3 on Mac. You can view the conversion progress and cancel the converting process at anytime. 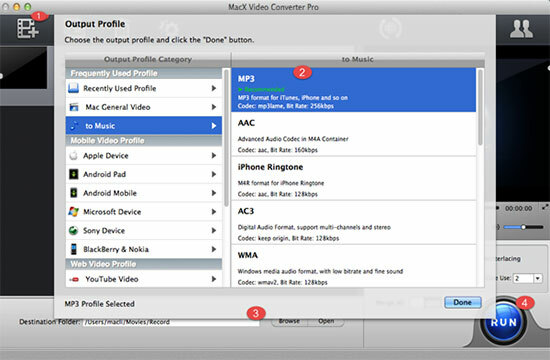 A video to MP3 converter for Mac absolutely meets your need of converting video to MP3. But what is the best video to MP3 converter? Here you know after viewing the top three MP3 converters on extracting MP3 from videos as your ringtones or directly for playback on iPhone iPad, etc. Guide you to convert WMV to MP3 on Mac with a WMV to MP3 Converter Mac which can convert WMV to MP3, AAC, AC3, WMA and other audio formats and WMV to/from MP4, MKV, FLV, MOV and other video formats with few clicks and high output quality. 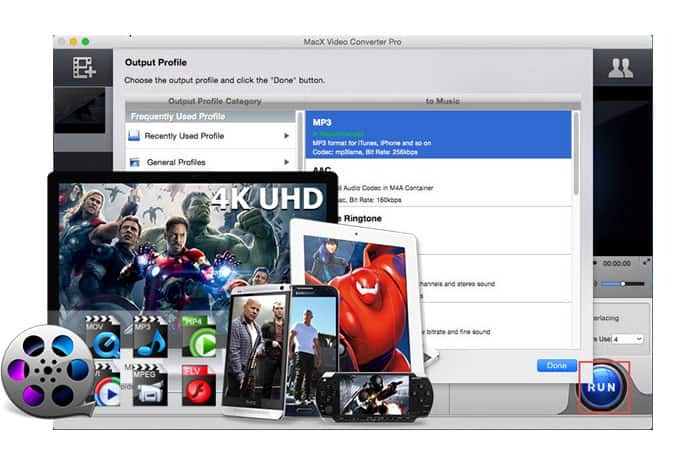 MacX Video Converter Pro is the best MP4 to MP3 converter Mac with top quality and super fast speed. This feature-rich video converting software also can help you easily download HD or SD videos from YouTube, Vevo and more 1000+ sites.